The acidic tones and commercialised vacuity of his works are used to underscore the insincerity of his figures’ mirth. As both antagonists and anti-heroes, Yue’s hysterical cohorts equally bully the viewer and stand as subjects of ridicule. 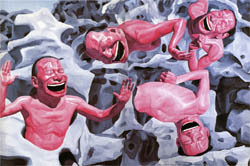 Using laughter as a denotation of violence and vulnerability, Yue’s paintings balance a zeitgeist of modern day anxiety with an Eastern philosophical ethos, positing the response to the true nature of reality as an endless cynical guffaw. 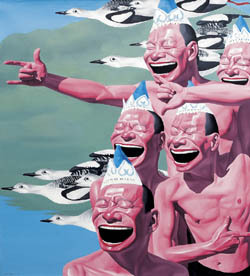 The Grand Tour, Chinese Contemporary, London, England. The First Exhibition Of The Upriver Gallery Collection, He Xiangning Art Gallery, Shenzhen, China. 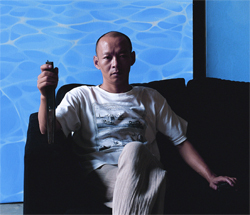 It's Me!-A Profile Of Chinese Contemporary Art In The 90s, Forbidden City & Tai Miao, Beijing, China. China Now, Tokyo, Japan; Basel, Switzerland.